After the record-breaking auction during the 40th anniversary Elvis Week this past August, there will be another opportunity to own a piece of music history as highlights of the rare Elvis Presley artifacts to be included in the upcoming “Auction at Graceland” were announced today along with registration information and catalog ordering details. The auction event will be held during Elvis’ birthday celebration at Graceland on Saturday, January 6, 2018 at 1:30 PM Eastern / 12:30 PM Central. Fans and collectors from around the world are expected to participate on-site and online in this extraordinary auction of Elvis Presley memorabilia, featuring artifacts that have been thoroughly researched and certified by Graceland Authenticated. All auction items will be offered from third-party collectors. None of the items included in the auction will come from the treasured Graceland Archives. The mansion and all artifacts in the Graceland Archives continue to be owned by Lisa Marie Presley and are not for sale. Every lot in this auction is accompanied by a letter of authenticity from Graceland Authenticated. The auction will be held in the theater at The Guest House at Graceland. Online registration and bidding is now open at GracelandAuctions.com. The official print catalog for the auction, featuring over 200 pages of full-color images and detailed descriptions for all auction items is available for order. This exclusive catalog offers an up-close look at these special pieces of Elvis history and is a wonderful collector’s item. 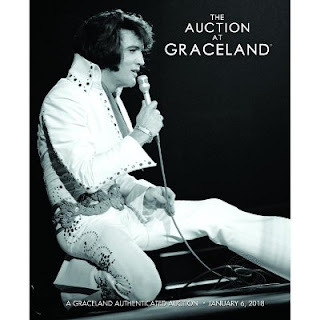 The auction catalog is available at the Graceland Official Online Store as a pre-order item. Select artifacts will be on display at the Elvis Presley’s Memphis exhibit complex at Graceland now through January 4th during opening hours and on Friday, January 5th from 10 AM until 8 PM Central in the Rock conference room at The Guest House at Graceland. An Impressive Diamond and Platinum Ring Gifted to Linda Thompson from Elvis Presley, Estimate $30,000-40,000. - The spectacular, diamond ring is a clear example of Elvis’ generosity with its multitude of gorgeous, round, brilliant cut diamonds in a circular design intertwined with exquisite tapered baguette diamonds in a platinum setting. Elvis Presley Owned and Worn TCB Necklace Gifted to Dean Nichopoulos, Estimate $20,000-30,000. - Dean Nichopoulos is the son of Elvis’ physician Dr. George Nichopoulos and was gifted this TCB necklace by Elvis. Elvis Presley’s Grand Prix Chrome "TCB" Sunglasses with "EP" on the Bridge - Gifted to Ed Parker and Shown in His Book Inside Elvis, Estimate $20,000-30,000. - These Grand Prix-style sunglasses are another gift Elvis chose to bestow upon his close confidant, karate instructor, bodyguard and friend Ed Parker. Elvis enjoyed gifting Ed with tokens that contained their shared initials such as these stylish spectacles. 1954 Elvis Presley Earliest Known Concert Performance Poster - Eagle’s Nest, Estimate $15,000-20,000. - The Eagle’s Nest was one of the first paying gigs for Elvis and the very first consistent venue at the start of his career. Elvis performed at the venue 16 times in 1954. The Eagle’s Nest was where Elvis initially gained notoriety among the teen crowd and where his unique style began to flourish. Famed Los Angeles radio personality Brian Berne, who owned this item previously, has said he considered the poster to be one of the true “Holy Grails” of concert posters. “TLC” Necklace Gifted by Elvis Presley to Dr. Nick’s Wife Edna Nichopoulos - Given on the Day He Received His “Ten Most Outstanding Young Men Award,” Estimate $15,000-20,000. - On January 16th, 1971, Elvis gave the wives of his entourage gold TLC necklaces which were a version of the TCB necklace he would give to those in his inner circle. One of Elvis’ proudest moments was the day he received the U.S. Jaycees “Ten Outstanding Young Men of America” award and it was fitting that he would want all his friends and their wives to share in his joy with this token of appreciation for their contributions to his achievement. Elvis Presley’s Leather Rocking Chair from the Jungle Room at Graceland, Estimate $10,000-15,000. - The original man cave! Prior to the 1970s, the jungle room at Graceland was referred to only as the “den,” and it differed in decoration from the way fans know it today. This leather rocking chair was Elvis’ favorite in this earlier rendition of the room, and he would often relax seated in this regal rocker in his spare time. Elvis Presley Signed Title to His Circle G Ranch, Estimate $10,000-20,000. - During a horse-buying excursion in Mississippi, Elvis spotted a 65-foot, white cross overlooking a manmade lake on a beautiful piece of land. Elvis proceeded to knock on the door and purchased “Twinkletown Farm” from the owner that very day. Elvis renamed it “Circle G Ranch” for Graceland. The property soon became a retreat for Elvis and his entourage where he could escape the pressures of Hollywood and superstardom. Elvis Presley’s Personal Massive Wooden Desk from His Home Office in Palm Springs, Estimate $10,000-20,000. - While Colonel Tom Parker and his father, Vernon, generally took care of business dealings, Elvis always had his own office where he would often read or review his concert schedule. This desk is from Elvis’ private office in his Palm Springs home. Elvis Presley Owned 1922 Colt “Police Positive” .32 Caliber Revolver with Ornate Engraving and Ivory Inlaid Grip by Edward H. Bohlin - Gifted to Tour Promoter Tom Hulett, Estimate $5,000-10,000. - The striking revolver with custom, ivory inlaid grip by famed craftsman Edward Bohlin, was gifted by Elvis to Tom Hulett who, with Colonel Tom Parker, managed Elvis’ live performances in the 1970s.